Is my conversion goal working and can I edit it? 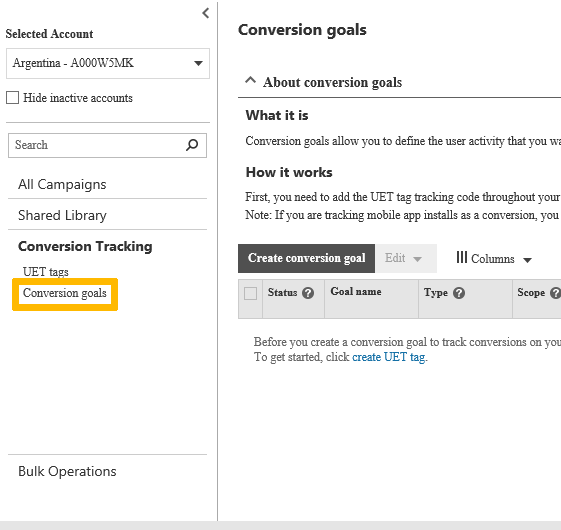 The Conversion goals page allows you to review each goal and track the goal type, status, and the number of conversions. The status of the conversion goal which can be either - active or paused. There is no delete but you can pause conversion goals. When a goal is paused, Bing Ads stops counting conversions for that conversion goal. Yes. In the table, hover over the Status, click the arrow that appears, and then select Enable or Pause. What it is: The name of the conversion goal. Can I edit it: Yes. Click Edit and then Edit goal. Please note that after you choose a name for your conversion goal, the same name may not be used again in the future. What it is: This is the conversion goal type, which can be destination URL, duration, pages viewed per visit, event, or mobile app install. You define the type when you create the conversion goal. Can I edit it: Yes. Click Edit and then Edit goal. The edit only applies to the conversion goal going forward and doesn't impact the conversion goal data before the edit. What it is: It determines if the goal applies to all accounts or a specific account. Can I edit it: No. Once you set sharing, you can't change it. If you want to change the sharing scope, you need to create a new conversion goal and pause the old one. 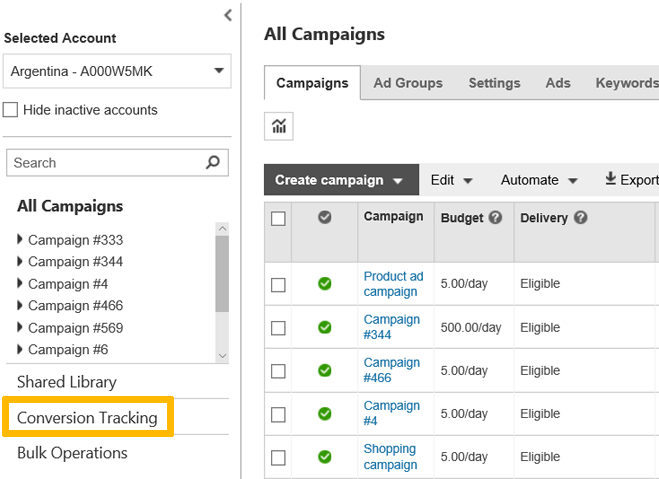 No recent conversions: Bing Ads has seen your UET tag, but haven't recorded any conversions in the last 7 days. This is most likely because you either have created the goal incorrectly, have not tagged your entire website, especially the pages that have the conversion action or you don't have any users converting on your site. Recording conversions: Bing Ads has seen your UET tag and has recorded conversions within the last 7 days. Note that the Unverified and Tag inactive statuses do not apply to Mobile App Install type goals. What it is: The name of the UET tag associated with this goal. Click on View tag to see the UET tag tracking code. What it is: This shows the number of conversions for this goal for the selected date range. You can change the date range in the upper right corner of the page. What it is: This shows the overall revenue tracked for this goal for the selected date range. You can change the date range in the upper right corner of the page.